VOTE Your Favorite Startup to Pitch at Tech Cocktail Celebrate: Who is The Startup Pavilion Crowd Favorite? Throughout the year, Tech Cocktail has uncovered the hottest startups from around the country. From Boise to Boston, Dallas to DC, Minneapolis to Miami, NYC to New Orleans, Portland to…well…you get it. Each Mixer featured one Reader’s Choice and Best Pitch winner, each sharing the honors of their city’s Hottest Showcasing Startup. So too have we done with Tech Cocktail Socials, where the editorial team hand selected their favorite startups amongst dozens of applications. All of this excitement has culminated toward one massive conference and startup competition, Tech Cocktail Celebrate, which will take place in Downtown Vegas at the end of this month (October 24 – 25). ONE winner will emerge as the Hottest Showcasing Startup in the Nation, as determined by the Pitch competition at the event. Of the 60+ startups who won the honors of Hottest Showcasing Startup in their respective city, only 24 will be asked to join the Pitch competition (to a host of big name judges). We want you to decide one of the Pitching startups. At the bottom of this post is a poll including the startups who will be taking part in the Startup Pavilion at Tech Cocktail Celebrate. The poll will end on Monday, October 14th at 5pm EST. The startup with the most votes at that time will be invited to join the on stage Pitch competition. It’s that simple. 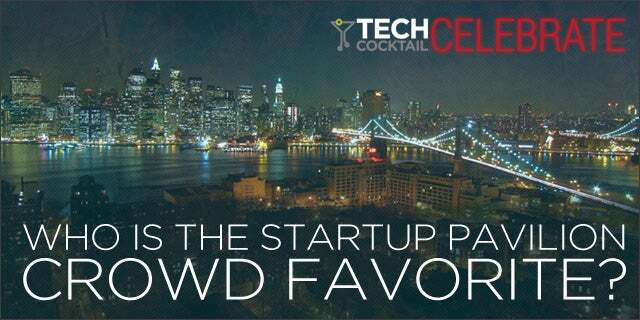 And after voting for your favorite startup, be sure to root them at Tech Cocktail Celebrate! 3D Film Connection (Las Vegas, NV) – The NEO3DO 3D Android Tablet allows users to see engaging 3D images without the glasses, and convert all 2D video to 3D, and we have 3D video games, all converted real time and streaming. 360Candidate (Los Angeles, CA) – 360Candidate enables a collaborative environment whereby hiring teams can review robust candidate profiles 24×7 on all platforms and devices. The information collected from the candidates is customizable to include video responses, third-party references, written responses, brag books, social data, and much more. BestBequest (Washington, D.C.) – BestBequest.com allows users to preserve their digital legacies in the world’s first ever online digital LegacyVault. Powered by patent-pending, cloud-based technology, it gives people the tools to plan ahead for life-changing events by safely storing personal documents, such as wills or living wills, pictures, videos and other items with sentimental value, like family recipes, in the LegacyVault. In the event of a life-changing event, BestBequest.com lets users determine who would have access to all of these digital assets, which also could include passwords to social media, financial and email accounts. CelebratePlus (Dallas, TX) – CelebratePlus is an innovative group funding platform that allows you to manage your events online, share them with your friends and family, and raise money to support your event. Think Evite + Kickstarter. CPUsage – CPUsage makes it easy to consume massive amounts of compute power in the cloud. A Platform-as-a-Service for scientists, researchers, and software developers performing high throughput and high performance compute applications at scale. egoBoom (Denver, CO) – egoBoom lets people crowdsource insight into their personal, professional and creative life by collecting and sharing honest, anonymous feedback with the people and organizations they care about. Simply put, egoBoom provides a better way to share opinions online. FishingGear.com (Portland, OR) – FishingGear.com is a marketplace for lure makers, tackle crafters and gear builder. We provide a platform to allow buyers and sellers to connect, share ideas and source unique products. Forward Metrics (San Diego, CA) – Founded in 2011, ForwardMetrics is changing how organizations achieve results. Our software platform FM Navigator simplifies turning ideas into plans – then accelerates implementation. Based in Southern California, the company’s passion is helping companies grow and achieve goals. Furywing (Chicago, IL) – Furywing is revolutionizing gambling entertainment for players that grew up with Nintendo controllers. We create and license games you are familiar with playing but add a gambling element of chance to them. It’s like Angry Birds with gambling. FundDat – FundDat is a reward-based crowdfunding platform specifically designed for projects created in or about New Orleans. We are where people find and fund cool projects that impact NOLA. Jebbit (Boston, MA) – Jebbit is a new way for you to interact with brands you care about Instead of bombarding you with ads, brands use Jebbit to reward you in cash and deals for engaging with them. Itizen (Minneapolis, MN) – Itizen is a mobile-centric, peer-to-peer marketplace for used children’s clothing and goods. Our mission is to provide a global platform for buyers, sellers and brands to come together around their niche interest, thereby tapping our “communal wealth” and reducing our environmental footprint. Lucky Orange (Kansas City, KC) – Lucky Orange is a suite of usability and customer feedback tools for website owners. It allows you to record and playback visitor browsing sessions, generate heatmaps of visitor clicks/movements/scrolls, let’s you chat with your customers while watching their browsing experience, and offers realtime analytics and customer polls. Tradezby (Formerly My Trade Cart) (Las Vegas, NV) – Tradezby formerly known as My Trade Cart offers a unique service and item trading platform with deep social media integrations. Being able to communicate with friends, family and colleagues is essential today. Tradezby’s platform is built with the trading principle in mind. Users will have the ability to trade items and/or services with people in their network of friends without any cost. SquadUP (New York City, NY) – Squadup allows for simple and social event hosting. Find friends, send invitations, collect funds and communicate in realtime. Recoup (Washington, D.C.) – Consumers want to purchase products ranging from everyday items to luxury travel deals online and also want to make an impact when making the purchase, however there are not many options in today’s e-commerce space. With Recoup, consumers can make these purchases and also select a non-profit to which they want to make an impact for. Tabeso (Las Vegas, NV) – Tabeso is an iPhone app that connects the best event information in the world and combines that data with your social connections. Whether you’re looking for free plays in th park, or the best concerts coming to your town…we gather data from sources across the globe and put them at your finger tips. And we give you the world’s best sharing features so that you can easily attend events with your friends and family. TheraSpecs (Phoenix, AZ) – TheraSpecs are precision-tinted, thoughtfully designed eyewear that filter the wavelengths light shown to trigger or worsen migraines, headaches, eyestrain, and other health problems. Indoor TheraSpecs protect from artificial light such as fluorescents and computer screens, while outdoor TheraSpecs provide more relief than sunglasses by filtering on the wavelengths of light that cause the most pain. Multiple clinical studies have show the efficacy of the tint used in TheraSpecs. TripTuner (Washington, D.C.) – TripTuner is a patent-pending recommendation engine that finds ideal travel experiences based on traveler tastes. An addictive design invites users to fine-tune preference sliders like “beach” vs. “mountain” or “relaxing” vs. “active.” Images of matching options update instantly, with no typing, text links or lists. Over half a million user preferences in 145 countries have been fine-tuned to date. Revenue comes from licensing partners such as national tourism board Brand USA, online travel agency Havas Voyages in France and the luxury Kempinski Hotels brand. Valet Boss (Tampa Bay, FL) – Valet Boss fixes the way your valeted vehicle is retrieved by allowing the user to request the car as while staying indoors. No more waiting outside in the heat, snow, rain, and cold to retrieve your vehicle. It allows the user to take control of the valet experience. While Apple's iPhone revenues declined 15 percent from the prior year, all other products and services' revenue grew 19 percent. There's a reason Tim Cook is proud of Apple's 1.4-billion-strong active install base – it's core to the company's service-led future. The internet is already awash with rumors about OnePlus' upcoming replacement for the 6T. Will it be all-screen, have a pop-up camera, or offer 5G compatibility? We've taken a look at all the leaks to work out whether they're on the money or wide of the mark. When Zach Davis isn't getting lost in the mountains, he is hustling from Boulder, CO as Tech Cocktail's Director of Marketing. He is the author of Appalachian Trials, a book chronicling the mindset necessary for thru-hiking all 2,181 miles of the Appalachian Trail, a feat he accomplished in 2011. Zach is a green tea enthusiast, die-hard Chicago sports fan, and avid concert-goer. Follow Zach on Twitter: @zrdavis.